Naturally occurring in the body, creatine functions as an energy store increasing maximum strength and endurance. The only non-Chinese creatine monohydrate manufactured exclusively in Germany. CREATEAM® Creatine Monohydrate is manufactured using Creapure® brand of creatine monohydrate from AlzChem, a Degussa company located in Trostberg, Germany. Every lot of CREATEAM® Creatine Monohydrate is HPLC tested for purity and Kosher Certified. Please be aware that many suppliers of low cost Creatine products use inferior quality Creatine Monohydrate and supply a "Distributors" Certificate of Analysis prepared by the local importer. NutraSense has the original manufacturer's (AlzChem LLC) signed certificate of analysis on file and available on request. The nitrogenous molecule/amino acid Creatine is produced naturally in both humans and animals where it plays an integral roll in the supply of energy to muscles throughout the body. Creatine is converted to Phosphocreatine in muscle tissue where it, in turn converts ADP to ATP to replace the ATP consumed during exercise. The more Creatine and Phosphocreatine present in muscle tissue the longer the muscle can continue to perform before fatigue sets in. Based on existing research, NutraSense believes that Creatine supplementation has broad application as a drug-free, dietary supplement for both the young and the not-so-young. Specifically, it can be used to prolong peak performance in athletes, to enhance strength and conditioning during training as well as reduce fatigue in older, active individuals. A person's ability to store creatine can be compared to the gas tank of your car. Once your creatine tank is full, it will not hold any more, no matter how much more you consume. The key to proper creatine usage is to find maximum benefit from the lowest dosage. Currently there are no specific dosage amounts, although there are some common theories. One of the most popular is the loading phase, which consists of taking approximately five grams 3 or 4 times a day for a period of five days. This is followed by a maintenance phase, which consists of 2-5 grams per day thereafter. Another theory suggests that the loading phase is unnecessary and wasteful. An individual supplementing with only the maintenance phase (2-5 grams/day) will have the same muscle saturation in 2-3 weeks as the individual who loads. Creatine absorption is quickened when taken with a substance that increases insulin levels, like dextrose. This increased absorption can be achieved by taking powdered creatine with grape juice or any other beverage high in dextrose. Ingesting creatine with a meal will also provide the same effect due to the increased insulin production. Some studies have also shown that exercised muscle will absorb about 12% more creatine than a non-exercised muscle. It follows that taking creatine directly after a workout maybe more helpful, although not necessary to achieve benefits. Maximizing the level of stored Creatine Phosphate (20% or more) by supplemental ingestion of Creatine has been shown to extend peak athletic performance for longer periods during short duration, high intensity exercise. Creatine supplementation permits athletes in training to work their muscles harder and longer. This ability to allow muscle to perform additional, heavier work translates into greater strength and improved conditioning. As a result, serious athletes worldwide are using Creatine as an integral part of their strength and conditioning programs. Disease or age-related Creatine deficiencies in the brain and skeletal muscle can be improved by the oral administration of Creatine Monohydrate which can help restore a more active, normal life style. Also see: Study Shows Creatine Strengthens Elderly and Patients with Neuromuscular Disease - USA Today. It is our belief that Creatine supplementation via CREATEAM® has broad application as a dietary supplement. As described above, it can be used to prolong peak performance in athletes, increase strength and conditioning, and provide more energy to older, less active individuals. A search of the literature yielded a number of articles on Creatine supplementation including two reviews of particular interest. The first is entitled "Creatine in Humans with Special Reference to Creatine Supplementation" from the Karolinska Institute Department of Physiology and Pharmacology and the University College of Physical Education and Sports in Stockholm published in 1994. The second is "Creatine Supplementation: Its Effect on Human Muscular Performance and Body Composition" by J. S. Volek et al, Journal of Strength and Conditioning Research published in 1996. Both are excellent review articles and should serve as a starting point for further investigation. In addition, we have a number of other references that have been summarized for your review and are available on request. Is the creatine in the bottle that you buy manufactured in a cGMP (current Good Manufacturing Practices) facility? A company may achieve cGMP only by complying with strict manufacturing practices including stringent quality control. Is the creatine certified for its purity and quality? A creatine manufacturer supplies a signed certificate of analysis attesting to its purity. Ask for it and make sure that it shows no impurities such as dicyandiamide or dihydrotriazine. Don't accept unsigned certificates or certificates that are not directly from the manufacturer. And finally, where is the creatine manufactured and by whom? Make sure that your Creatine is from a reputable manufacturer from a country that is known for its quality. 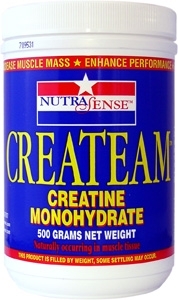 CREATEAM® Creatine Monohydrate is unsurpassed in quality and effectiveness. Not only is CREATEAM® Pure Creatine Monohydrate manufactured in Germany by AlzChem LLC (a Degussa company). Each lot of CREATEAM® Creatine is subjected to HPLC testing for purity as well as microbiological tests using standardized methods. A Certificate of Analysis from AlzChem is available on request. Suggested Dosage: Research suggests a loading dose of 20 grams per day for 5 days divided into 4 servings of 5 grams each. This si followed by a maintenance dose approximately 2 to 5 grams per day in order to sustain creatine levels. Administration: It is important to increase fluid intake in conjunction with creatine usage. Have been using this product for years. Has been effective and has maintened quality over that time. Fast delivery. Great price. Great product.